So why create an image from a sript rather than a template? Flexibility really. If you have "gold images" or templates, you need to maintain them, which means applying updates, testing, and hoping that nothing slips by your regressing testing which means that the changes you just made to you image, don't stop it working if you need to rebuild a server you built 12 months ago. Assuming you test that kind of thing at all. So there, I am importing the module from my ISO, mounted on d:, setting my parameters, and then creating the image. 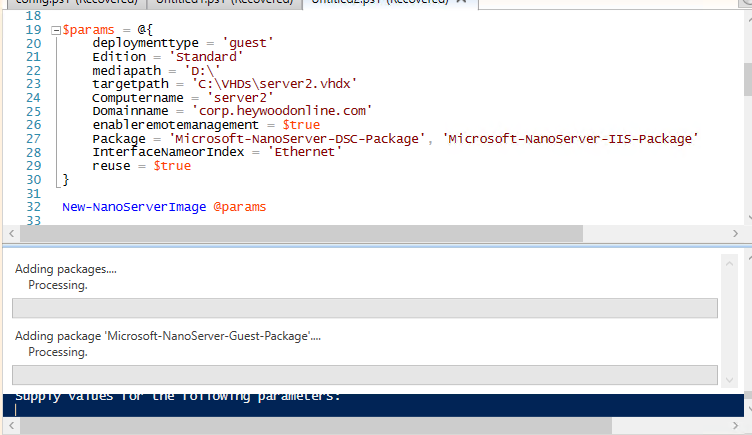 In this case, I am adding two packages to my base image, and it is using DHCP. The base image ends up not much more than 500mb. Not bad for a Windows Server. DHCP? Really? Yes, really. When creating a VM based on this image, I set a MAC address as part of that process, which matches a reservation in DHCP, so I know what the IP address will be as soon as the server is up, so this way is much more straight forward. Note that if the PC you create the image from (that you run the above command on) is NOT in the domain that you specify, you can't join it like this, you need to use a domainblob.